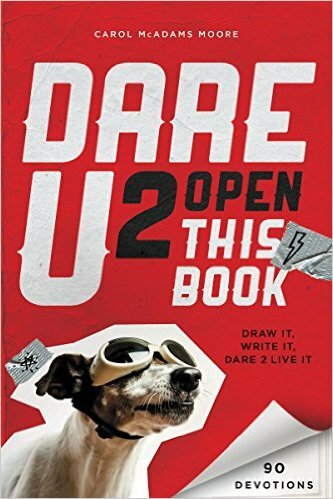 Dare U 2 Open This Book is a small devotional/activity book for younger readers. Each devotion follows a simple formula. It opens with a Bible verse and then goes into a short devotion, barely a sentence in length, with a “radical” approach to exploring the verse. After that, it presents a “What If” question with a short activity (involving drawing and other crafts). The book breaks away from the formula at times, but the majority of the devotions use this pattern. As young as eight years with the max age being ten to eleven. The book is safe as far as devotion books go, including all the standard Christian messages for kids (Jesus loves you, we’re all sinners, you aren’t too young to share the gospel, etc.). Some of the devotions can be impactful, such as being careful not to fall back into bad habits, but most of them are right lightweight and lack any substance, which some kids would look for. The writing tries way too hard to get in with the “hip” crowd, relying on vocabulary like “peeps” or “pics” in order to capture the voice of youth. It even goes as far as to rely on text speech, using such lazy abbreviations as “R” and “U” rather than writing out “are” and “you.” This works against the book, as it seems as though the writer is talking down to kids rather than approaching them at their level. The other problem is this book is not recyclable. Like all activity books, once a child goes through it, his or her doodles and sketches will fill the pages, and the writing isn’t strong enough to encourage a second reading. If anything, this is a good book to give to a child so who can later look back on it as an adult and read through what he or she wrote. But when it comes to library use, it is not a good fit. Brian J. Branscum is a professional writing major at Taylor University.